The tendency (met by a more familiar one going in the opposite direction) towards flatter, fairer forms of self-organisation. "The definition for heterarchy offered by Stephenson in her footnotes is “an organizational form somewhere between hierarchy and network that provides horizontal links that permit different elements of an organization to cooperate whilst individually optimizing different success criteria.” While this is a useful definition, this needs to be understood and accepted by others before the argument for heterarchy can proceed to action. A more commonly used definition is that used by Carole Crumley, who suggests that heterarchy is “the relation of elements to one another when they are unranked or when they possess the potential for being ranked in a number of different ways.” This evokes both the reality of multiple levels, and the communication between levels that is critical in transcending the dysfunctions of pure hierarchies. It is valuable to remember that organizations are intrinsically systemic. Systems theory and its progeny have helped us to understand how some characteristics of systems and organizations can be self-sustaining. As such, shifting from hierarchies to heterarchies can only be done effectively by viewing the interrelated entities as elements in a system, which very likely will incorporate mechanisms that make structural change difficult." 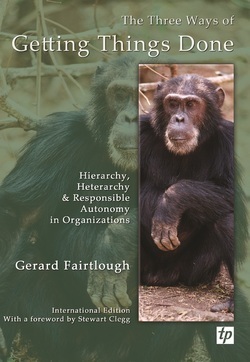 Heterarchy is one of Gerard Fairtlough's Three Ways of Getting Things Done (the others are hierarchy and responsible autonomy). "Anarchy, it seems, is less attractive than rigid hierarchy - and heterarchy requires constant tinkering and fussing via negative feedback loops. We have had experience in addressing these issues before, but not in ongoing, always-on real time everywhere. To where will it all lead we don’t know - but there’s a good chance that this time it will be substantively different. Homo Collegiens is a new term that I have come across recently... hmmm. What continues to fascinate me is whether, how and when the critical mass of larger organizations that our modern society knows so well will begin to address honestly the clear evidence that a fundamentally new set of conditions - interconnected smart people and increasingly smart software - demands fundamentally different responses to their environment of interconnected customers and employees. And yet … for each of these initiatives, there has been an equal and opposite reaction towards … more control, increased hierarchy, a growing divide between winners and losers. It’s as if we collectively don’t know how or can’t trust ourselves to operate in self-organizing, self-regulating, wise networks that will do what need to get done. And this, I think, is the deeper message I am taking from Steven Johnson’s book - that the self-organization, the changes to the meta-rules of how humans work together in purposeful action and systems, will happen despite the best efforts of the commanders to effect their will. It all depends on where you look at it from - 10 feet up, 10,000 feet up, 100,000 feet up or a million feet up. If we continue to remember the profound impacts of an order-of-magnitude change to societies around the world due to a profound shift in the means of distributing information and knowledge made available by the printing press … then the emerging changes to us and our social systems due to the gobal wired interconnectedness will, I think, inevitably lead to an age of wirearchy - a dynamic n-way flow of power and authority based on knowledge, credibility, trust and focus on results enabled by interconnected people and technology. This will be the first age where we are truly, at the meta level, governed by the feedback loops that we create, both consciously and unconsciously. We will be organized for, and governed by, the dynamics of championing-and-channeling rather than commanding-and-controlling. I believe we are seeing this unfold in front of us, daily. Generally, the people at the top don’t like it one bit." As Fairtlough rightly says, the hegemony of hierarchy is harder to shake than one might expect and as Alain de Vulpian, social anthropologist and commentator observes, the tendency towards flatter, fairer self-organisation is always matched by an equal 'tropism' towards more hierarchy and control. I'm not so sure as Jon that the goodies will win.